Spire, a Gothic arch and windows, two carved angels, and eight-pointed stars and gold cellophane decorate this vintage Cherubs Madonna Crib. A copy of Raphael's Sistine Madonna altarpiece graces the Cathedral of the Blessed Sacrament, Sacramento, California. One of the magnificent pieces of sacred art in the indescribably beautiful Cathedral of the Blessed Sacrament in Sacramento is this copy of Raphael's Sistine Madonna. It's said to be the last Madonna the Renaissance master painted circa 1512-1514, before his death. It was intended as a large altarpiece for the church of Saint Sisto, in Piacenza, in what where then the Papal States, but this masterpiece's odyssey took it to Poland and Russia, before taking pride of place in Dresden's Gemäldegalerie Alte Meister (Old Masters Gallery). The artist of the vintage Cherubs Madonna Crib simplified the composition (absent are St. Sixtus and St. Barbara and the multitude of cherubs almost hidden behind the clouds and green curtains. But the two cherubs that Raphael painted resting on the communion rail now rest on the cloud on which the Madonna stands holding her infant son. It's a powerful image, celebrated through the ages, and beautifully adapted as a three-dimensional crib. The Cherubs Madonna Crib is made up of just four pieces: the Front, the Madonna piece and its supporting Band, and the Back/Side Walls pieces. The Front depicts a Gothic church, beautifully decorated with two kneeling angels, spires, an arch, and a rose window. The Front is topped by small arches and windows that can be highlighted with the addition of cellophane. I chose gold, but blue, red, or green would work as well. The delightful interpretation of one of the Raphael angels placed on a cloud in theCherubs Madonna Crib. The Back/Sides piece is wonderfully filled with tiny eight-pointed stars and adorned with three Gothic windows — whose tracery can also be filled with cellophane, as shown on the large image at the top of the page. But it's the Madonna and Child — not to mention the two adorable little cherubs that Raphael placed at the communion rail and our crib artist on a cloud — that will enchant you. It's a celebrated image, and scores of artists and painters have attempted its interpretation. All I know is that it is a powerful, captivating image, and I can confess sitting in a pew opposite the canvas adorning the Cathedral of the Blessed Sacrament in Sacramento for a long, long, time. Construction of the Cherubs Madonna Crib is simple: folding is along straight lines, and assembly is easy — the side wall tabs are attached to the back of the front, the Madonna Band inserted into the holes on the side walls, and the Madonna piece centered and attached to the Band. 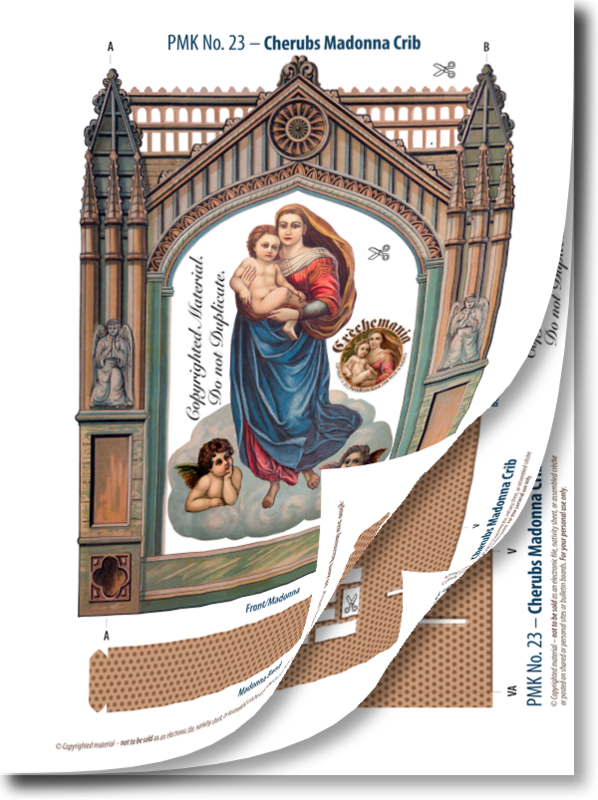 The Cherub Madonna Crib PDF includes two pages to print, assembly instructions, and large images that show the construction. Raphael's Sistine Madonna, accompanied by two cherubs, stands on a cloud, framed by a Gothic façade, and surrounded by eight-pointed stars in this simple-to-assemble vintage crib. Size: 6.25 x 7.75 x 2 inches.